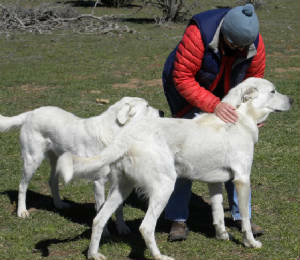 This is Jeannie with Banjo and Matilda our two Akbash livestock guardian dogs. They are full brother and sister and have never been separated. They work as a team with Kara (see below) to protect the flock. We don't have predator problems. 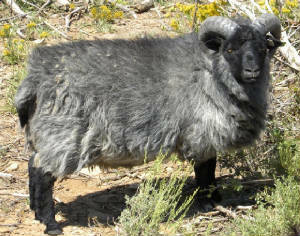 The Shetland Sheep is a native of the Shetland Islands off Scotland and posseses one of the finest fibers in the world. It is very strong, is a great insulator, and spins, weaves, knits and works wonderfully. 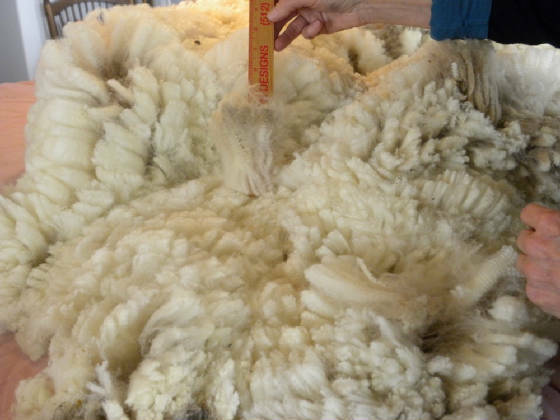 We shear once a year usually in April. They live mainly on forage and grass with a small amount of supplement to ensure adequate vitamin and mineral intake, with 100% grass hay during the winter. This is Spice. 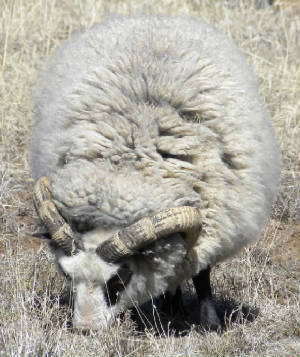 He is the only Jacob sheep in our flock of Shetlands. Our herd was chosen for the quality of their fiber. We chose rams that were used to each other and who 'got along' well. They have good personalities and, of course, great wool. This dynamic gives us as stress-free a herd as one could hope for. 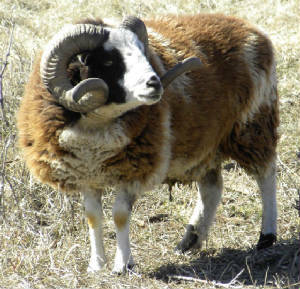 We do not keep an intact ram on the property and all our males are neutered to reduce stress within the flock. This in turn adds to the quality of their wool. This is Louis' fleece. All our sheep have names and are treated humanely and with respect. They are allowed to be a sheep and have plenty of room to roam and browse. We do not keep them in confined areas except at night for their own protection when they are restricted to the barn and an outside yard. They are protected by our three livestock guardian dogs. We have not had any wildlife problems. This is Panda, named for the black around both eyes. 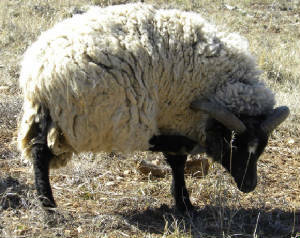 This photo was taken about one month before shearing. At 8,000 feet in the San Juan Mountains of Southwest Colorado and a high-desert environment, we have warm summers and cold winters with low humidity. This climate is mild compared with their native Shetland Islands off Scotland where the winters are much colder and wetter. We believe our environment allows for a better clip of wool from our Shetlands. 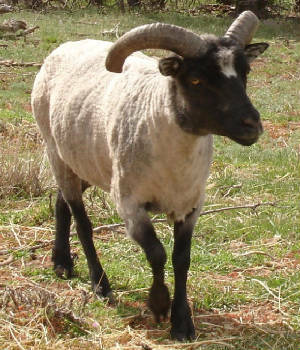 Jack is our pet Shetland sheep ram. He was bottle raised and therefore very friendly and sweet. He either thinks he's a dog or he believes our guard dogs are his pets. He follows us around and comes for affection. His fleece is of exceptional quality. ... and this is Kara, our Anatolian Shepherd livestock guardian dog. Her name comes from Ankara, the capital city of Turkey, and the area where her breed eminates. 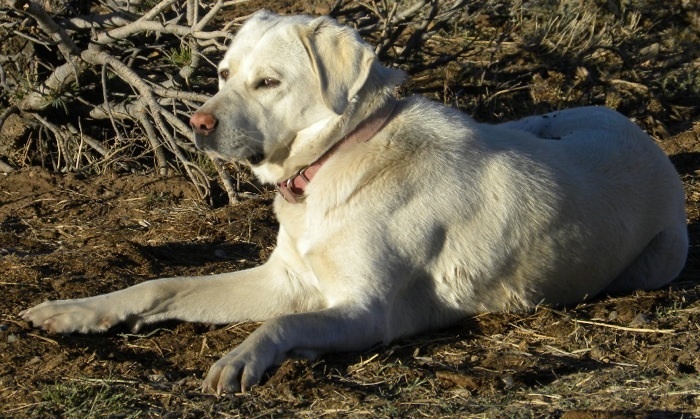 She is a very friendly dog to us and our guests, but doesn't like any other animal coming into her pastures. Since she arrived we have had no problems whatsoever with wildlife - and we are in coyote, bear, and mountain lion country. She and Jack the ram get along fabuously - she thinks Jack is her pet sheep.